The cool serene mountains of Bhutan offer a rare experience to those looking to trek the landscape. 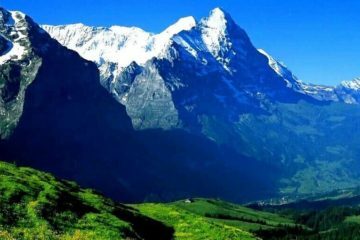 The country offers a wide choice of trekking routes crisscrossing through stunning jungles, mountains, lakes, rivers and forests. The clean air, mixed with the sounds of buzzing insects and birds is another treat while hiking across the mountains of Bhutan. Trekking routes are exclusive and not crowded. The altitude varies quickly while trekking in Bhutan. Within a few days, one can hike through the subtropical forests, across the temperate jungles of central Bhutan and emerge in the alpine mountain regions of the north. However, there are many trekking routes in Bhutan. Trekkers can chose from those that take months to a pleasant one-day hike. 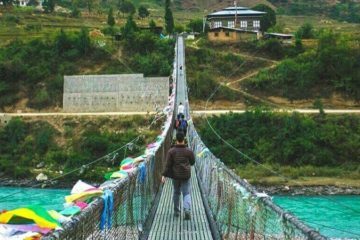 Most begin by hiking the gentle trekking routes surrounding the capital city Thimphu. 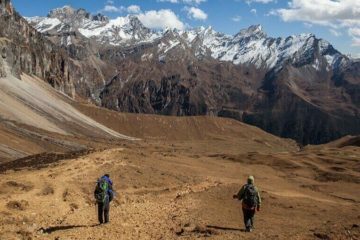 Some of these easier trekking routes can be covered within a few hours or a day. For those seeking adventure in the snowy mountains of the north, trekking can be increasingly difficult. The famous Snowman Trek is considered one of the most difficult and also the most rewarding. Professional guides accompany the trekkers and camps are set on top of ice across some parts of the route. Other helpers and horses carry materials and gears across the route. The Snowman trek route runs at an elevation of over 5,000 meters above sea level and is regarded by many as the most difficult in the world. 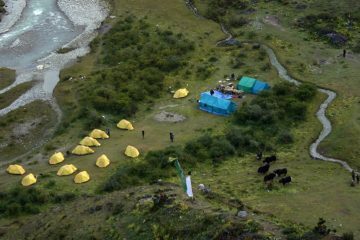 However, trekkers are treated to a sight of majestic mountains of the Himalayas and stunning glacial lakes. The Snowman trek takes about a month to complete. There are also several other slightly moderate trekking routes that take about eight to ten days. The Jhomolhari trek takes eight days and is at a slightly lower elevation. One of the most popular trekking route connects the capital city Thimphu with the beautiful valleys of Paro. 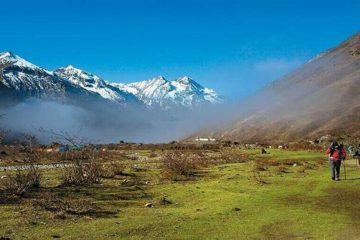 Known as the Drukpath trek, the route runs through many beautiful lakes, valleys, rivers and villages with typical two storied traditional Bhutanese houses. The Druk path takes around five days to complete. Trekking in Bhutan can also be a great opportunity to mingle with the local communities and join in the celebrations and festivals. Some trekking routes offer great opportunities to witness and explore the diverse variety of birds. Various species of fascinating plants and flowers also grow in abundance across Bhutan. Rhododendron flowers bloom in the northern alpine regions during spring. Spring and fall are the best seasons to trek in Bhutan. Bhutan is a heaven for over 700 species of birds. Explore our Bhutan Trekking Itinerary and choose the one to suite your adventurou needs.